One of SpaceFlight Insider’s newest members, JD Taylor began his tenure with our firm with the launch of Orbital Sciences Corporation’s Antares rocket and its payload of the SS Deke Slayton, Cygnus, spacecraft bound for the International Space Station with about 5,000 lbs (2,268 kg) of cargo. It would never make it. 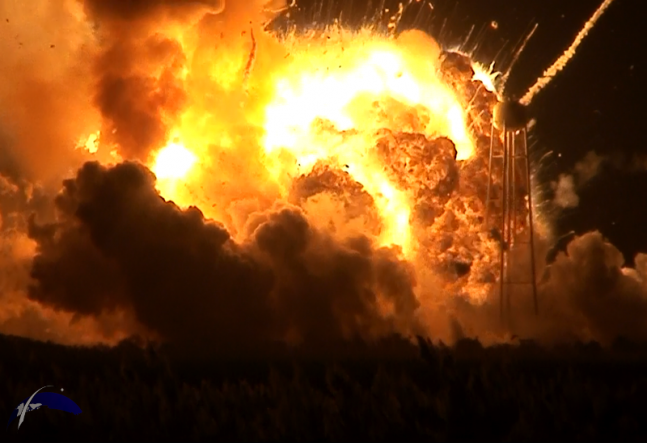 At approximately 12 seconds into the flight – something went terribly wrong – and the rocket exploded into a massive fireball falling back down to Wallops’ Pad-0A below. Taylor obeyed the frantic commands of the Wallops staff to run to the bus – leaving his equipment where it stood. The video below – shows the awe-inspiring power of the loss of one of these launch vehicles – from a mere 2.11 miles (3.39 kilometers) away. Even more jarring than the frantic instructions of NASA employees and volunteers ordering the journalists on hand to get to the buses – is, for the uninitiated, the impact shockwave of the explosion’s tremendous sound. It was so loud, that it visibly and violently shakes the cameras. The Wallops Incident Response Team completed today an initial assessment of Wallops Island, Virginia, following the catastrophic failure of Orbital Science Corp.’s Antares rocket shortly after liftoff at 6:22 p.m. EDT (2222 GMT) Tuesday, Oct. 28, from Pad 0A of the Mid-Atlantic Regional Spaceport at NASA’s Wallops Flight Facility in Virginia. The initial assessment is a cursory look; it will take many more weeks to further understand and analyze the full extent of the effects of the event. A number of support buildings in the immediate area have broken windows and imploded doors. A sounding rocket launcher adjacent to the pad, and buildings nearest the pad, suffered the most severe damage. At Pad 0A the initial assessment showed damage to the transporter erector launcher and lightning suppression rods, as well as debris around the pad. Department of Emergency Management, the Virginia Marine Police, and the U.S. Coast Guard. The Wallops environmental team also is conducting assessments at the site. Preliminary observations are that the environmental effects of the launch failure were largely contained within the southern third of Wallops Island, in the area immediately adjacent to the pad. Immediately after the incident, the Wallops’ industrial hygienist collected air samples at the Wallops mainland area, the Highway 175 causeway, and on Chincoteague Island. No hazardous substances were detected at the sampled locations. Additional air, soil and water samples will be collected from the incident area as well as at control sites for comparative analysis. The Coast Guard and Virginia Marine Resources Commission reported today they have not observed any obvious signs of water pollution, such as oil sheens. Furthermore, initial assessments have not revealed any obvious impacts to fish or wildlife resources. The Incident Response Team continues to monitor and assess. location, to allow the U.S. Navy to return back to work.